Welcome to the busy executive’s guide to hiring an agency. This guide is approximately 7,000 words, or 23 pages in an ebook. If you don’t have time to read the whole thing today, I recommend that you download it here to save and read later on the go. Thank you for reading! In 2012, I was approached by three different friends who were heads of marketing at companies in New York City. They had all hired agencies to help them grow. All three had experienced less traffic and fewer customers as a result, instead of their goal of more traffic and customers. 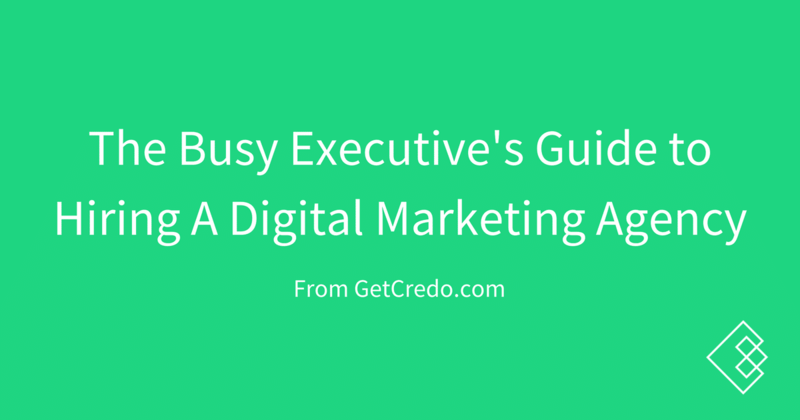 They were frustrated and so was I.
I’ve written this guide for you, the head of marketing at a company that is growing in all the best ways possible. Maybe it’s your first time in this role, or maybe you’re a seasoned professional and you’ve done it before. No matter your experience, marketing changes quickly and you need help keeping your head above water. You have many challenges, including competitors, determining and landing marketing budget, working well with your colleagues, and hiring and enabling a great team. The industry constantly changing makes this even more challenging than it should be. As you navigate all of the challenges in your work, you also have to keep the company’s important metrics moving in the right direction. Talk about pressure. You probably feel like you have four different jobs, and that’s because you do. You’re trying to build, enable, trust, and motivate a team. Many directors and VPs of marketing at companies that are growing will lean on an agency or consultant simply because hiring a full time inhouse position can be time consuming, expensive, and often risky. Hiring an outside provider to help is often the right move, but comes with its own pitfalls. If you’ve never hired an agency before, you are likely wondering where to start. If you have, then you have lessons you’ve learned but you also recognize that you have other blind spots. That’s where this guide (and Credo) comes in. Since late 2015, I have seen and helped over 1,300 businesses get connected with and hire a digital marketing agency. The goal, of course, is to take the business to the next level by engaging with the right strategic partner. Previous to that, I was the lead marketer on two known nationwide brands under the Zillow Group family of brands where I built and led teams and made more than my fair share of mistakes. Before that, I worked for two digital agencies, in New York and Philadelphia, and drove a lot of traffic and business their way. Consulted with over three dozen businesses and over a dozen marketing consultancies (agencies and consultants) on how to hire and how to deliver better work. Across the businesses I’ve helped with Credo, I’ve seen every type of business organization. Some companies look at an agency as an addendum to their existing marketing organization, while others look to an agency to be their marketing department. Neither is right or wrong necessarily, as what you need and when you need it depends heavily on your business, your personal experience and skill set, and the team you have in place already (or the lack thereof). You just need the guidance on how to put this strategy together. 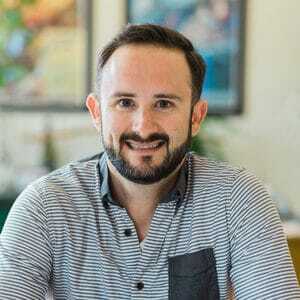 My name is John Doherty and I am the founder of GetCredo.com, where we’ve seen over 1,300 businesses and $8,000,000 in marketing spend come through Credo since September 2015 looking for help getting connected with the right marketing provider for their needs. I live in Denver Colorado with my wife and our very large black labrador Butterbean. In this guide, we will examine four main areas that are critical to your success and determining if an agency or consultant is right for your business. First, we will talk about how to know if you need an agency or consultant to work alongside you and your team. Second, we will talk about team structures, business dynamics, and how to build an internal team to support working with an agency. Third, we will talk about how to identify a good agency and the questions you need to ask and have answered before hiring someone. We’ll also talk about why a “test project” is a bad idea. Finally, we will cover how to know if the agency you are working with is getting you the results you signed up for. This section is going to help you begin to figure out if you are ready to hire an agency, or if the right move for your business is to hire an internal team first. Hiring is exhausting and can take up most of your time while doing it (trust me, I’ve been there). If you are hiring relatively senior people or are looking for a very specific skill set, then this can drag out for months in the best of times with a recruiter supporting you, and longer if you must conduct the search yourself. An agency can be a shortcut to getting programs started, but only if done right. I’ve seen companies make both great and terrible decisions about when and who to hire, so let’s talk about when you need an agency versus when you need an inhouse team. As you may expect, often the answer is “a combination” but we’ll get to that. I once received a call from a head of marketing who was tasked with growing their software business, but they had been told by their investors that they could not hire anyone else full time until they had improved their metrics. The head of marketing had two other employees, but they were all generalists who were great at getting things done. They had identified that a specific channel was already wildly profitable and effective for them, but they did not have the expertise internally to take it to the next level. They had the budget to hire, but were not allowed to bring someone on full time. You have inhouse teams dedicated to that channel but do not have a large backlog and need to determine your future plans for that channel and build out your backlog. Realistically, agencies often end up being more expensive than a part or full time employee. You’re paying for expertise and the ability to scale the number of bodies on the project so that you can save time. Short term you will likely end up paying more than hiring a full time employee simply to speed up the process. If your goal is to save time by getting campaigns and channels started quicker, as well as scaling your limited resources, then hiring an agency can be very much the right move. Unfortunately, the decision is not always as easy as simply looking at the four areas above. Your decision making becomes more difficult. Someone on your team has tried to learn a channel, but they have not been able to gain the skills quickly enough. An agency will give them time and potentially a mentor to learn from. These are the toughest situations to be in, and tough calls have to be made. Normally I default to finding an agency first to help you get the programs off the ground and heading in the right direction. Then you can bring in someone more senior to own the channel and tweak the strategy into their preferred direction. One great way to make this setup work is to hire an expert-level consultant or agency with the understanding that in a period of time they will help you hire someone full time internally. If you are wondering if you should hire an agency or step in yourself to fill a gap (in addition to your managerial duties), you should look at your budget and see if you have the budget to hire an outside provider to get the work done. Stepping in yourself to straddle an individual contributor/manager role is almost never the answer as one of those will not be done well enough. There are absolutely occasions where you either do not need to work with an agency at all or where you are not ready to work with one yet. You have a very small budget or “want to start with a test project”. The first two bullet points above are rather self-explanatory and have also been covered in other areas here, but let’s talk about the budget point for a minute. I have spoken with many companies who either have a small budget to start with or who want to “test” the waters with a small budget before committing to investing in a channel. In either of these two cases, my recommendation is that you should probably not hire an agency at all because you will not see results (there is one caveat here that I have put below). Why do I say this, especially as someone who runs a business that helps you find the right provider to work with depending on your budget and needs? Because I care about the long term and about you seeing success with your business engagements and the channels you invest in. If you have a very small budget, then you will need to spend something else (time to gain expertise) so that you can prove out the channel and grow your business so that at some point you are ready to engage with an expert/group of experts to expedite your growth. They are not convinced that the agency or consultant they are thinking about hiring will be able to get them the results they are looking for. In both cases, this is a lack of clarity problem and not a budget problem. In the second case above, this is also a vetting issue. If you want to play it safe because you still have questions, you should dig deeper into those questions (Credo helps here as well as you get close to making your decision) with the agency to make sure that you feel comfortable with them. Otherwise, you should walk away. Sometimes I hear “What’s the worst that could happen if we hire them for a limited engagement and it doesn’t work out?” Realistically, the worst that can happen is that you waste time, money, and your business moves backward instead of forward. It is better to take the time up front to properly feel comfortable in an engagement and put real budget towards it than wasting your time, your money, and potentially your business opportunity. I am quite opposed to hiring someone for a “test” project, as I wrote about more in-depth here. Good marketing, especially SEO when you do not have an existing SEO program, takes time to make a meaningful impact on your business. You realistically will not see results for 3-6 months, depending on what you need and speed of execution, so a short term “test” project is already set up to fail if you are looking for marketing services. Caveat: if you have a small budget to begin with, you could consider hiring a small agency or consultant to do an audit and put together a strategy and recommendations document for you. A small budget put towards services will take forever to show you any real forward movement, but a limited engagement for an audit and strategy can provide outsized value. Check out the companies on Credo who offer SEO Site Audits here. “Test” projects with a small budget working with an agency will slow down your progress and time to channel viability. Thus, it is better to take the time to answer all of your objections before committing to a project with an agency. Testing with a small budget when you have more available is a vetting and planning problem, not a marketing problem. If you’re already determined to hire an outside strategy or services marketing provider to help you grow (and have read the previous section about if you are ready), then you need to build out a team to support your initiatives and manage your channel partners. Even if you are not ready to hire an outside provider just yet, the likelihood that you will want to hire one in the future is high and so you should be thinking about your team organization ahead of the curve. You may already realize this, but if you’re a marketing leader then your success hinges on your ability to hire, train, retain, and motivate an amazing team. If you are straddling the line between manager and individual contributor, you cannot stay there for long. I did this for a period of eight months at HotPads while building out my team, and it was the hardest and most stressful period of my career. The best thing you can do as a marketing leader is hire yourself out of a job, and to do it constantly. Find great people, hire them, and then let them own the areas for which you hired them. If you don’t do this, you’ll have high turnover on your team. Your job, and secret to success, is to hire and enable great marketers to do great marketing. This means supporting them with the monetary resources as well as people to get things done well. Your job is to remove impediments to their success from their path. Your job is not to be a channel operator and a manager at the same time. Head of marketing, with a few channel owners, who commissions strategy and opportunity audits for new channels before hiring a channel owner. I have come across a few relatively large companies ($50M+ a year in revenue) who have hired a consultant on a (well compensated) long term basis to handle agency relationships while they hire a new VP/director of marketing who will then scale out the marketing team to then own those agency relationships. This setup is the exception not the rule, but it is a viable option for the right company and team setup. Here are some clear visuals into how the businesses mentioned above structure themselves. This is the most common team setup. There are senior marketers who manage teams of more junior marketers. These are sometimes channel-specific, and sometimes it is not clear who owns which channels. You can see the problem here. This scenario works well when the teams have specific areas of ownership, whether a product or channels. These teams will still often tap agencies for specific needs. In this scenario, the business is committed to working with agencies that specialize in each area. Each area has a clear owner who then manages the agency. Sometimes one agency can work across channels and help with integrated marketing campaigns, but sometimes specialists are needed. Which you need depends on your team composition and current needs. 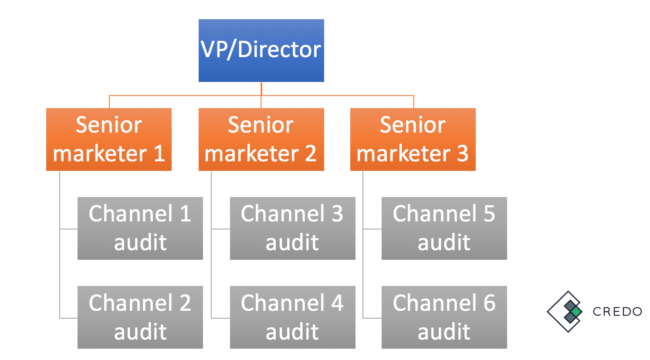 In this scenario, the three senior marketers are all tasked with different channels and in charge of determining the strategy and viability of the channel they own. They’ll work with an agency (or consultant) to define the opportunity and strategy, and then determine if they should hire someone to own that channel or if the agency should run with it. Which structure is right for your company? 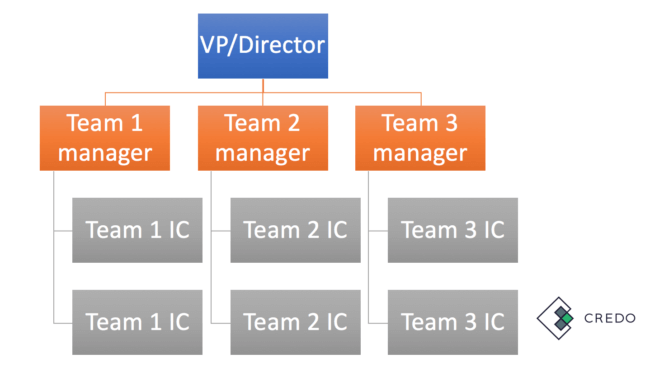 The first rule of structuring your team is that there is no right structure. Also, do not forget about your own experience hiring and enabling a great marketing team. Your personality, experience, and skill set will determine the team you hire and the outside partners you need to engage with. Most larger companies ($50M+ a year in revenue) I have encountered and worked with as a consultant build out the first structure listed above. They’re well-established, have their acquisition channels identified and growing, and are further along the path to having a long term sustainable business. In this case, agencies are used to accelerate rather than to get new channels off the ground. Most medium sized companies ($10M-$50M a year in revenue) I have encountered and worked with are building out the second structure listed above. These teams have a fairly clear idea of what works, but need to move faster than hiring a full team. It is quite natural to go from this structure to a full built out team. It is much harder to go from the first structure to this more lean structure. The downside of this approach is that you need channel owners who are also very adept at project management and happy filling that role. You need manager-level channel owners who can make the agency relationship profitable. Most scaling companies ($1M-$10M a year in revenue) fall into the third category. If you are in this stage, you probably have a person or two on your team in addition to yourself, though you are likely still the main marketer on some of the channels. In this stage, you have to be choosy about the channels in which you are investing and working with an outside partner. Your team’s time is limited and your skill sets may be varied yet still limited, so you have to find the right partner that works with your team in the ways you need. Contrary to what social media (or the Google search results) will tell you, there is no one “best” marketing agency that can get outsized results for every business. Don’t be discouraged though, because there is a “best” agency for your specific business. This means that they do amazing work for businesses like yours that have budgets and goals similar to yours. Hire an agency that has substantial experience in your industry by overpaying them slightly and communicating with them constantly, holding them to account on the metrics you agree beforehand are most important to your business. We’re going to unpack this in the rest of this guide. Identifying a good agency is a tough task if you’ve never worked at an agency or hired an agency before. Finding the right agency for your business’s unique needs and setup can be downright daunting if you don’t know where to start. This is a large part of the reason Credo exists (we can help! See how we work). You’re looking for an agency to solve problems you’re having. Whether that’s enough hands on deck to execute on your campaigns to expertise that you don’t have inhouse, you’re relying on them to get you out of a pickle. Therefore it is imperative that you trust that the agency can solve your problems and not waste your time. Don’t hire someone just because they’re cheap. You get what you pay for, every time. These are the questions we recommend that you ask and get answered, but you should also recognize that there is no “right” answer for most of them. At Credo we try to take the question of “Can they do the work well?” off the table so that you can concentrate on finding the right fit for your company across expectations, timelines, team structure, and more. These questions help you not only qualify and vet them quantitatively, but also qualitatively. That second part is important and often missed. The biggest reason why a consulting/marketing services arrangement fails is not because the agency cannot do the work. It is because personalities and expectations clash. If you can get those out of the way before an engagement even starts, you will start with a high degree of certainty that it will be successful! One of the areas we help marketing teams do is is define their project so that they can approach an agency in a way that makes sense for both parties. At the risk of giving away our secret sauce, I want to teach you how to put a brief together yourself so that you can approach agencies with confidence. (NAME) is the (TITLE) at (COMPANY), an online marketplace that sells (product type). The site has more than 1,100 unique products on the site, and its inventory changing on a daily (if not hourly) basis. Currently they are looking for an agency to work with them on their SEO needs. They have been struggling to close the loop on implementation of basic SEO principals and build momentum with their current SEO agency and are looking for someone to help them figure out where their current opportunities lie. Their goal is to increase organic traffic and conversions on their site through a more focused SEO campaign that addresses on-site optimization, keyword targeting, link building, and other appropriate strategies. Other areas of opportunity to explore after SEO needs are addressed is content marketing. (COMPANY) is a B2B focused software company that provides a tool for (vertical) to communicate with customers, bill customers, and manage their business. They’ve been in business for about a year and are about to raise another round of investment. Going into that they want to put together a comprehensive digital strategy to help them open up the top of their funnel and drive more leads through the funnel to becoming paying customers. They are also potentially interested in having this same marketing partner help them build a new public-facing website that will rank and convert better to drive even more customers. If you look at these examples, you will see that they follow a specific template that we have refined over the last few years. Finally you need to define your budget. We do not do that publicly for the projects that come through Credo, but we always ask you what your determined budget is. We can help with that on the phone call, and you can also get a better idea of digital marketing pricing benchmarks through our digital marketing industry pricing survey. Money is one of the hardest subjects to talk about. This applies in business just as much as in your personal life. Just like it feels weird to talk to your friends about money, many businesses feel strange being transparent with an outside partner about the real budget available. We want the best agency we can get for the best price possible. Unfortunately, this mindset and answer are not helpful and are actually extremely counterproductive to your project’s success. The most successful projects we have seen involve both sides being transparent with and trusting the other. Let me put this plainly: the vast majority of people are honest and not looking to take advantage of you. Yes, there are bad actors who are indeed trying to take advantage and make as much money as possible for as little work as possible, but should we be optimizing towards those bad actors instead of towards the good ones? I once had a client come through Credo who was getting a lucrative business started in a fantastic location. They had funding and talked a big game, like they were ready to make a real run at succeeding and were ready to put substantial marketing budget behind working with an agency. But when I put them in contact with some agencies, the agencies came back and said that the client only had $500/mo to spend. The client was annoyed, the agencies were annoyed, and I was annoyed. The sad thing is, all of this could have been avoided if the client had been honest with me about what they could spend. Be transparent with your budget limitations. Most providers (and all of them that we work with on Credo) are not out to take advantage of you. Starting off the relationship by withholding information and playing power games does not set it up for success. Hiring a great agency doesn’t stop when the ink is freshly on the contract (or you know, you’ve e-signed it). To truly know that you’ve hired a great agency, you need to see traction forward in a reasonable amount of time. The best way to do this is to have a check-in a quarter (three months) after you begin the engagement. The metrics they report should be agreed upon ahead of time (these are in the questions in the previous section above), but this is not just a metrics review session as they should be providing you reports frequently based on the work that is being done. I recommend that every quarter you take stock of how the engagement is going from a quantitative and qualitative point of view. During this section of the review you should look at metrics and the work that has been delivered. This should also be a time to review how quickly work is being delivered and deployed. Because marketing progress (especially SEO progress) is only seen once changes have occurred and campaigns have begun being executed upon, this is a very important indicator to track in order to improve the quality of the project. You should be able to give feedback to your agency on how well you are working together. As the marketing director/VP/lead, you should be communicating with your team member who is the point of contact about how the project is going. If they are having challenges working with the agency, then this is where you can add the most value. If the project is ongoing and you need it to succeed, you owe it to yourself to make sure that both sides are happy and productive within the relationship. If you are not able to fill this role, then the chances that the relationship will not succeed increase substantially. One of the first things a good agency will do is help you define the metrics on which the project’s success will be measured and then set up your analytics so that those are being tracked by everyone. This doesn’t have to be complicated, but it can be if you’d like it to be. The first thing I do when I start with a new consulting client is to build a dashboard within Google Analytics (or their dashboarding tool of choice) so that everyone has transparency any time they want into how well the project is doing. You should expect and ask for no less of the agency you hire. Hiring a marketing agency and having confidence that you’re making the right decision is hard. Being a leader means making difficult choices and trying to gather as much useful information as possible before making a decision about which direction to go. At the same time, you cannot just continue to gather information ad nauseam. You must, at some point, make a decision to move forward. Hopefully the information contained within this guide has been helpful to you. If you’re at the point of looking to find an agency to work with, we can help you out here. If you are in need of consulting to figure out which direction to go with your team and whether an agency is right, we offer that as a service here. Regardless of whether we get the chance to work together now, in the future, or not at all I wish you the best of luck in your business and career. We’re always here to help.